On March 5, 2019, the International League of Antiquarian Booksellers held the symposium Who Owned this? 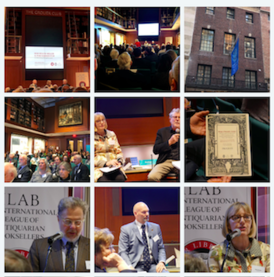 Libraries and the Rare Book Trade Consider Issues Surrounding Provenance, Theft and Forgery at the renowned New York book collectors club, the Grolier Club, jointly organized with the Antiquarian Booksellers Association of America (ABAA). Rare booksellers are faced with increasing demands from institutions to have strong provenance on materials they buy. Booksellers need to know how to deal with this and have a good understanding of what libraries need. The symposium brought together a range of experts and scholars from the antiquarian book trade, libraries but also investigation, insurance, art law and IT. Today marks the 1st International Provenance Research Day with more than 60 cultural institutions in Germany, Great Britain, Austria, the Netherlands and Switzerland organizing large number of symposiums and workshops at museums, archives and libraries. Coinciding with this important initiative, ILAB launches the videos of the New York Provenance Symposium. “The popular image of an old bookshop with a slightly eccentric bookseller selling books in a shop untidily crammed with books and a computer nowhere in sight, is not the modern reality. Antiquarian books, manuscripts, maps, prints etc. are constantly being traded across international borders. Because of this, identifying and keeping track of stolen items is ever more important and requires immediate response to prevent such items being on sold. The rules and regulations that govern this international market place are becoming ever more complex and difficult to keep up with for everyone involved from libraries, institutions, booksellers and collectors... Hence the need for this symposium.